.... by deleting it from your website, indeed. Previous posts on this site have demonstrated that evidence-free claims about the ability of chiropractors to cure/treat period pains, carpal tunnel syndrome and asthma are routinely appearing on chiropractor's websites - in the blogposts above, I linked to Glasgow Chiropractic as an example. [Many other bloggers are carrying out similar investigations into chiropractic claims, in light of the British Chiropractic Association's spectacularly bad decision to sue Simon Singh for stating there was no evidence for many of Chiropractic's claims of efficacy. One of the complaints to GCC was about Glasgow Chiropractic's claims on their website and so, using the power of the intertubes, and changedetection.com, a page monitor for two of Glasgow Chiropractic's pages was set up. This week, the first notice of change appeared. This provides a comparison of the old site with the changed one - click on 'View Changes' about half way down the page on the left hnd side. Notice on the left hand side in the yellow box, the word 'Colic' with a line through it. (You'll see the new page has the word 'Colic' removed). They've decided that chiropractic is no longer useful for treating colic. No need to tell anyone though, just say goodbye by deleting it from your website in a wonderfully Orwellian way. The internets never forget though. Before every action ask yourself - will this bring more monkeys on my back? Will the result of my action be a blessing or a heavy burden? His words seem extremely relevant in light of the recent chiropractic debacle. In short, the British Chiropractic Association is suing science writer Simon Singh for remarks made about the lack of evidence for chiropractic. This has led to the searchlight of skepticism being shone in every corner of the chiro world. Their actions have lead to many more monkeys on their back and the result is a heavy burden for the chiropractic community. IF YOU DO NOT FOLLOW THIS ADVICE, YOU MAY BE AT RISK FROM PROSECUTION. IF YOU DO NOT FOLLOW THIS ADVICE, THE MCA MAY NOT BE ABLE TO ASSIST YOU WITH ANY PROCEEDINGS. The McTimoney website itself now only has a basic holding page. It now reads like this. I usually find that treatment can relieve some/all symptoms, depending of course exactly what is going on. Most people with hip problems have a pelvis that is way out of balance. Balancing the pelvis changes the dynamics at the hip joint, and improves the nerve supply. Trouble is, complementary medicine does not have the money pharmaceutical companies have, nor are theralpes [sic] amenable to double blind trials, hence going at it by research publiched [sic] may not get you a realistic viewpoint. So the claim is that chiropractic can relieve the symptoms of arthritis, but evidence is not available because of lack of funds alog with special pleading that double blind trials are not suitable. Utter nonsense. There are many, many double-blind, sham-treatment controlled, research papers into chiropractic and other manipulation therapies. This reply is just a smokescreen to try and disguise the fact that the evidence is weak to non-existant. The various chiropractic associations are now wishing they had thought more carefully about the fall-out of the BCA's decision to sue Simon Singh. The number of monkeys is increasing every day. EDIT: Zeno has also covered the story here, DC is covering the story here, JDC's coverage is here and Frank @ SciencePunk has posted his post here. Chiropractors take money for trying to relieve asthma, despite a lack of evidence. What a wheeze! 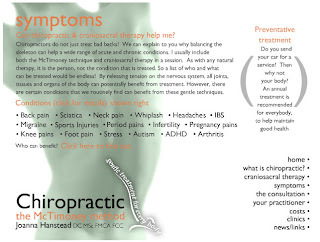 Previous blogposts on this site have demonstrated how a collation of published research, gathered by the independent body, The Cochrane Collaboration, has shown that there is no evidence that chiropractic can relieve menstrual pains or is any better than placebo or control at relieving carpal tunnel syndrome. * Preventing future symptoms from developing. Taken from the NHS website. As with carpal tunnel syndrome and menstrual pain, asthma is a condition which can be difficult to treat, can cause pain and inconvenience and is reasonably common - the NHS website suggests about 5 million people suffer from it in the UK. These is a classic situation for complementary and alternative medicine to step in and offer relief. The barrier to success is laid so low, as the patient is ready to try anything (regardless of evidence or how 'creative' the therapy is) just to get some respite from the condition. As with carpal tunnel syndrome and menstrual pain, the Cochrane Collaboration has published a review on the evidence available for asthma relief by chiropractic and can be found here. (The abstract and conclusions can be found here). The hesitance in the last line is due to poorly-run trial using massage therapy that indicated some benefit, however that is outwith of chiropractic. The author notes that the best run trial between chiropractic and sham treatment found no significant difference. Chiropractic care can help improve the patient's neurological status and respiratory function through stress management, lifestyle and dietary advise together with specific joint adjustments and exercises. I wonder how much is down to the chiropractic - the evidence suggests not a jot. Most common symptoms helped by Chiropractic are asthma, colic and repetitive ear infections. Many other chiropractic practices like Emerson's Green Chiropractic near Bristol also claim asthma as a treatable condition. How can the GCC claim to be regulating chiropractic when the treatments offered for specific ailments are not backed up by any worthwhile evidence? As discussed prevously, the Cochrane Collaboration has reviewed the available research on menstrual research and carpal tunnel syndrome and found the evidence lacking compared with placebo or control. In many cases, Chiropractic practices are claiming to be able to treat these conditions despite a complete lack of evidence. This post has demonstrated that asthma can be added to that list. Simon Singh has decided to appeal the illiberal ruling of Justice Eady, in the nonsensical libel case brought by the British Chiropractic Association, over his use of the word 'bogus'. David Colquhoun's blog DC Science and Andy Lewis' Quackometer are leading the charge, along with science charity Sense About Science, who have launched the "Keep Libel Laws Out of Science" campaign. Click here to get the SaS button for your website. Simon's Facebook page is here and Simon writes in his own words here. Jack of Kent has been following this story in full here. Chiropractors claim wrist action, but evidence states no happy ending. I'm talking about Carpal Tunnel Syndrome(CTS) of course. CTS is a relatively common ailment, which causes a pins and needles sensation in the fingers and hands. The NHS website linked to above, estimates that almost 5% of women and 3% of men have CTS. Most cases of CTS develop in people who are between 45-64 years of age. People with mild to moderate symptoms usually respond well to non-surgical treatment, such as wrist splints and corticosteroids injections. However, more severe cases usually require surgery to reduce the pressure on the median nerve. Left untreated, CTS may lead to permanent nerve damage. So this is a common problem, ranging from very mild to severe, but at the painful end of the scale, surgery is the only option. As with menstrual pain, the parameters are nicely set for quack therapies to offer hope of relief. Trials of magnet therapy, laser acupuncture, exercise or chiropractic care did not demonstrate symptom benefit when compared to placebo (or control). So the evidence gathered so far seems to be fairly clear and there is no reason why any self-respecting chiropractor would advertise that they could help CTS - it would be surely foolish? Surprisingly (or perhaps not), the deja vu continues - CTS, like menstrual problems, is a prime complaint for alternative medicine; Like menstrual problems, it has a Cochrane Review which concludes that, based on published evidence, chiropractic is no better than placebo or control; and lastly and incredibly, like menstrual problems, appears on numerous chiropractic websites as a condition that they are able to successfully treat. Dr (not medical) Chris doesn't seem to have read the evidence, but no doubt he has his 'own evidence' (anecdotes) as do homeopaths, faith healers, pendulum swingers, astrologers, mediums and any other branch of quackery and pseudoscience you can think of. (Incidentally, I haven't looked into Cold Laser treatment mentioned in the video, except to say that a review in 2007 said there was 'conflicting evidence' as to its effectiveness). I like the ice-cream van near the end of the video. [if] it is definitely carpal tunnel syndrome [...] a chiropractor can help greatly. Not according to the evidence, they can't. carpal tunnel syndrome [-] Chiropractic can help you recover quicker and with less pain. Other offenders include The Healing Clinic in York, Health Hydro (Swindon Borough Council website, if you're interested in complaining) in Swindon, the Chiropractice in Cardiff, the Chiropractic Clinic in Chester, and of course the Pain Relief Centre in Finchley, which boasts Chris Pickard from the above video. There are plenty more Chiropractors out there offering this quack treatment, despite the clear, available evidence that it is of no value over placebo or control. I have no idea whether these places are aware of the available evidence - if they are, then they are knowingly misleading and fraudulent (bogus, if you will), if they aren't, then their professional knowledge is questionable - would you want to be treated by someone who offers useless treatments, demonstrating their ignorance in their supposedly specialised field? Needless to say, the GCC will be made aware of this situation - will they just get a slap on the wrist?